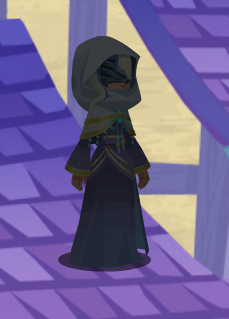 So, the big mystery in KHX/UX is who among the foretellers is the traitor. I'm thinking that there's a reasonable probability that it's Invi. We were only able to catch a glimpse of this figure after meeting Mickey for the first time. You can view the image below with the figure at the upper left corner. 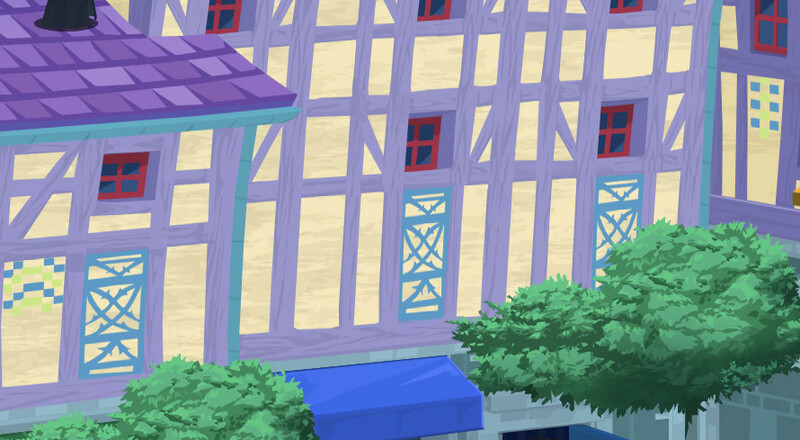 We can't see much, but it does look a lot like one of Xehanort's black coats, don't you think? It's actually the Anguis Foreteller! We have little information about this, but what do you think is going on? Why is this Foreteller watching over Mickey and the others? What could this be leading up to? 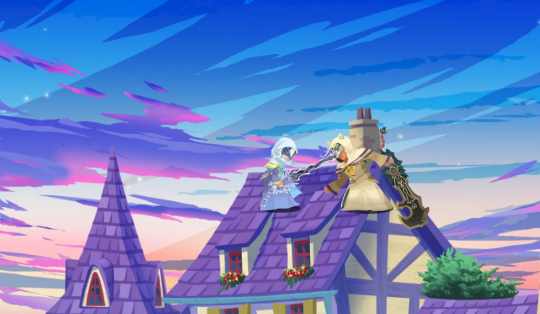 Aced trying to kill her on the roofs of Daybreak Town. I think the snake is the traitor, guys. Quick question is that your union forteller? If it is do you like know for a fact the foreteller in that first scene watching you and Mickey isn't set to change based on your forteller like other cutscenes? If that really is Invi set in the first cutscene (cause I know for a fact in the second you always see Invi and Aced regardless) it's quite interesting that two of the TAV-esque members have evidence of being traitors. Back then Sign was in Vulpes afaicr. Neat then I wonder if that mean Invi is who summoned Mickey? Afterall Mickey does say that he was guided there by some other power for some reason. It also make sense for a Foreteller to have done so because they have the book of prophecies and could believably call forth people like Mickey, Donald, and Goofy.....though for what purpose I can't imagine. To probably warn Mickey about something or tell him to take it and protect it, or take it somewhere so it would be safe. That could have been Vulpes though. She's a shapeshifter and has been testing characters of all the Unions. I honestly don't trust Anguis to give us reliable information about this sort of thing. Well, that said, I'm not sure if I trust anyone in this game anyways. Does this scene change depending on the Union? Yo. What if like the MoM, Nomura is telling us not to trust the foretellers, but really we can trust all of them... 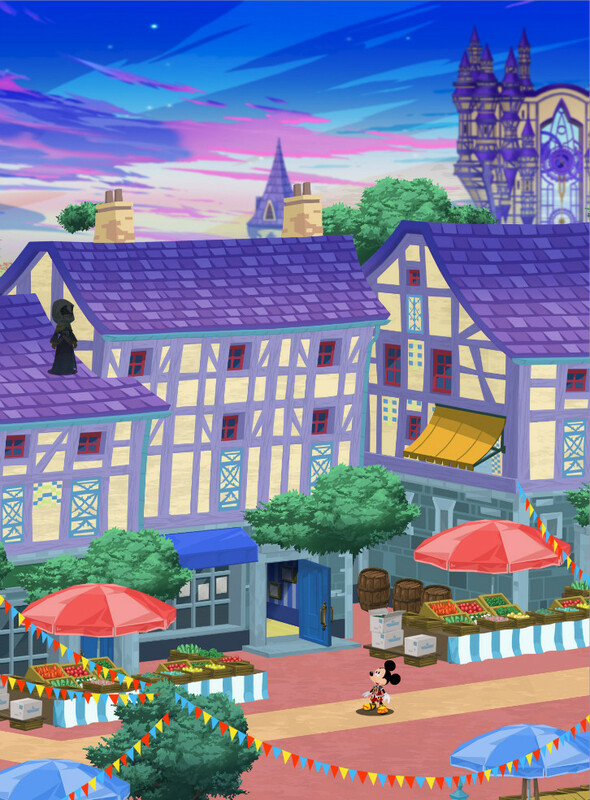 He just wants to see us doubt everything like the foretellers do... O_O KH traitor inception. I feel like the new updates will make us distrust each Foreteller more, and right now Ava and Invy are in the spotlight. I'm telling you its a self fulfilling prophecy! In the end, the traitor will be Chirithy. The lost page is shoved into its little coin purse. There's only one variation of this scene and the character that appears is always Invi, but to be fair, we also entertained the possibility that they were pressed for time and couldn't prepare a Black Coat sprite so they just substituted with a random Foreteller. It's worth double-checking the Unchained version of the scene to see if there are any differences. Yes, the Foreteller that appears here will always be the one for your Union. 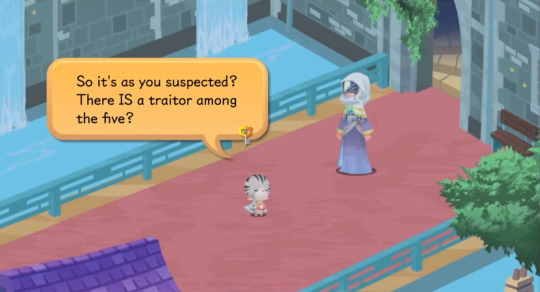 Which basically means back to Square one as apparently each Foreteller is addressed by Chirithy in this manner, meaning each of them got somehow their suspicions confirmed that there IS a traitor. Then again, it could be always Ava in disguise as her shapeshifting powers allow for that possibility and of course they have the prospect of even more confusion. Another question would be if only Ava has these powers or if all Foretellers possess them? Even the battle between "Invi" and "Aced" could not be as it seems as one of them might be again a disguised Ava. Oh... that's why I felt a faint sense of annoyance when I learned about Ava's illusory powers. Thanks to them, we have no way of verifying what's real or not! There is no single traitor, they'll all betray each other and it'll become a self-fulfilling prophecy. Calling it now. I would have agreed with that, but doesn't The Book of Prophecies talk about "the traitor taking the missing page?" Though the dialogue also changes based on your Foreteller it seems. but in my game, Chirithy says something like "Does this mean there is a traitor" with Ira replying "I'm not willing to believe that yet." Unless they changed the scene since the trailer?